A hallway of family portraits spurs a conversation between father and pup. There have been so many great dogs in their family. The great dog's portraits hang right there in the hallway. Each time the father explains how great one of their family members is, like Aunt Doris the fire dog, the illustration shows a maybe not-so-great event in that dog's life, like Aunt Doris standing on the fire hose so no water is coming out. As they discuss the portraits the pup wonders aloud if he'll be a great dog too, and the father reassures him he will - with a slight twist at the end. Great Dog reminds us that families come in all shapes and sizes and that even the greatest of us aren't perfect. 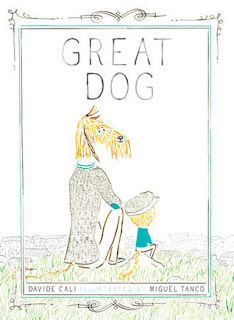 If you’re interested in reading Great Dog, you can purchase a copy here on Amazon.